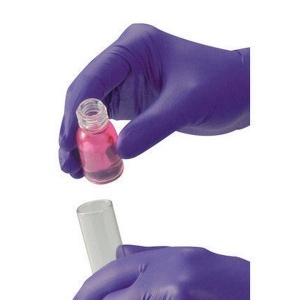 The Polyco Finite P Indigo AF Nitrile Disposable Gloves are premium powder free nitrile disposable gloves that are compliant to European Standard EN 374, providing an effective barrier against oils, acids and other chemicals. The Polyco Finite P Indigo AF Nitrile Disposable Glove has an AQL, or Acceptable Quality Limit, of 1.5 and also complies to Medical Standard EN 455 Class 1. Made from high quality nitrile synthetic rubber, it is extremely soft with increased elasticity, yet still maintains a tensile strength comparable to natural rubber. These disposable safety gloves are ambidextrous so can be worn on either hand and they have a unique shape for an improved fit. The cuff is beaded which adds strength and prevents liquid roll back which is important when handling chemicals and other potentially harmful substances. 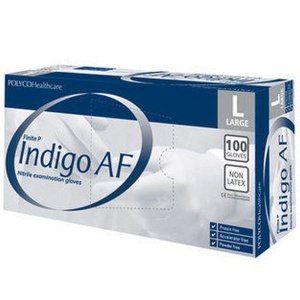 The Polyco Finite P Indigo AF Nitrile Disposable Gloves are free of proteins found in natural rubber which means they are suitable for users with latex allergy. The safety gloves also conform to Standard EN 1149 for anti static properties and are powder free reducing the risk of product contamination. The product code for these gloves is MFNP100. They are also available for purchase in case quantity. Advanced nitrile technology helps provide an exceptionally soft and pliable material which gives a high level of dexterity and comfort for the user. A unique shaped design delivers an improved fit. As the Polyco Finite P Indigo AF Nitrile Disposable Glove are made of a synthetic rubber, they have no latex proteins which eliminates protein skin sensitisation and means they are suitable for individuals with latex allergy. As these disposable safety gloves are powder free, they have no residual accelerators which are a cause of allergic dermatitis. 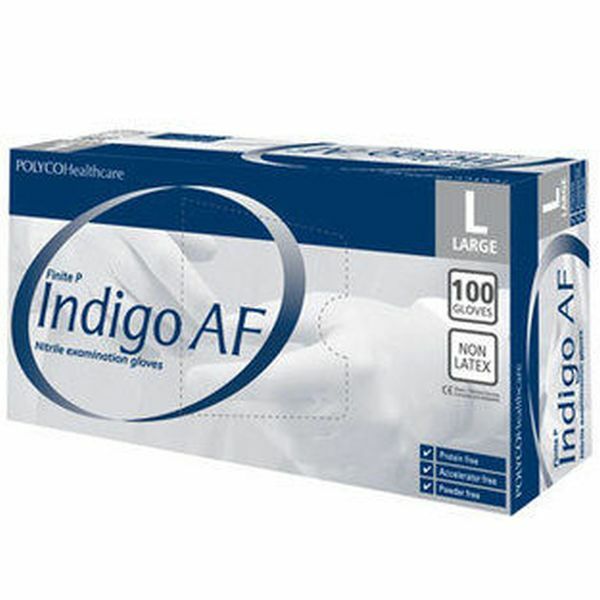 For Additional strength and prevention of liquid roll back, the Polyco Finite P Indigo AF Nitrile Disposable Gloves have a rolled cuff. This is very important for individuals making contact with chemicals and other potentially harmful substances. The Polyco Finite P Indigo AF Nitrile Disposable Gloves have been tested in accordance with European Standard EN 1186 and are suitable for use with ll food categories in situations of short term, repeat contact. Polyco Finite P Indigo AF Nitrile Disposable Gloves are non-sterile, powder-free, synthetic nitrile rubber disposable examination glove is in conformity with the provisions of Council Directive 93/42/EEC and with National Standards transposing harmonised standards EN455-1, EN455-2, EN455-3, EN455-4 and is self-certified as a Class 1 non-sterile medical device.